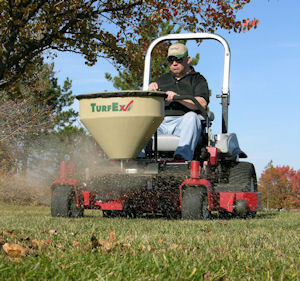 The new TS200 spreader is part of TurfEx’s full line of zero-turn mower attachments. Capable of spreading seed, fertilizer and ice melt, the spreader is engineered specifically to maximize mower productivity. It holds up to 2.5 cu. ft. of material, and features a corrosion-resistant polyethylene hopper to reduce weight and maintenance concerns. The spreading operation is controlled via the manual flow gate and electric-powered spinner, both of which can be actuated from the mower’s seat. Additionally, the spinner includes adjustable paddles for fine-tuning the spread pattern. A clear cover, universal mount and two-year limited warranty are standard.